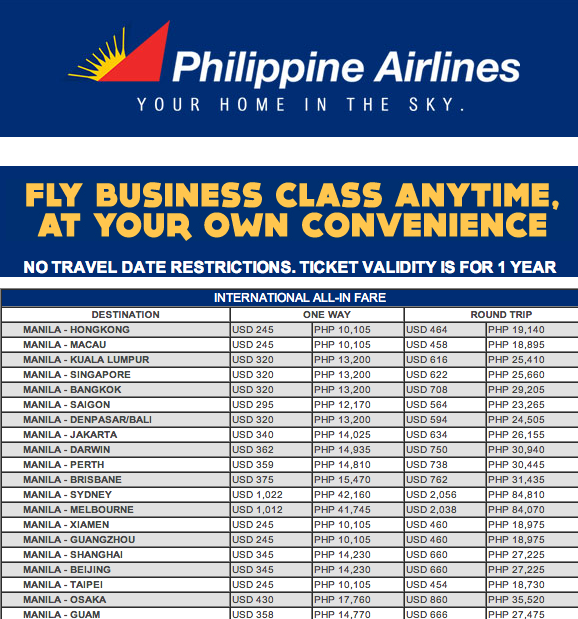 PAL PROMO- with the latest offers from Philippine Airlines, you can now be on board on a BUSINESS Class flight. The best part of this is that there is no TRAVEL date restriction. And it is valid for 1 year for all international and domestic flights. Please check above rates and destinations for international travel. Below is for domestic destinations. So there you go guys, book your tickets now! hi how to avail ths promo? You got a really useful blog about business class deals I have been here reading for about half an hour. I am a newbie and your post is valuable for me.